When I began to plan how I was going to attend Center meetings twice a week without my dad's knowledge, I didn't know the operational difference between a covert op and a clandestine one. As I would learn years later as a naval intelligence trainee, when an operation is covert, only the operator remains secret -- the target country knows something happened (like a facility is bombed) -- but it doesn't know who bombed it. Plausible deniability is the watchword of covert operations. A clandestine op, however, never happened. That's the plan anyway. Before, during and after the operation, the target country is blissfully unaware that anything is happening. That's what I was shooting for and I took inspiration from my favorite fictional spy at the time: Quiller. Dad introduced me to Quiller. Ironic. Quiller is a loner, he's introspective, and he never carries a gun. He's old school. 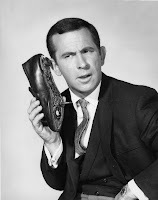 Unlike James Bond (or more humorously Maxwell Smart, pictured), Quiller relies upon tradecraft, not gadgets. Before any mission, Quiller thinks out all the angles, all the possibilities, and then acts. Quiller is nothing if not decisive. On paper, my mission was simple: get to and from meditations on Wednesday and Sunday nights undetected. In practice, however, it was dicey. While the San Jose Center meeting on Wednesday nights was nearby, the Sunday Center meeting was held in San Francisco, a solid hour drive north one way. On Wednesdays, I decided to make my way to the Center on foot. Before disappearing from home for the evening, I would make my presence known downstairs; let dad see me hanging around. Then, just before 6:30 p.m., I'd head upstairs to my room, pack my white meditation clothes, a towel, and some toiletries into a backpack, change into my running togs, and slip out my brother's second story bedroom window. I'd run the 2.5 miles to the Center, shower, and be ready for meditation at 7:30 p.m. An hour later, I'd hitch a ride back home with one of the other disciples and sneak back into the house via my brother's window. I'd be home by 9:00 p.m. -- two and a half hours max. San Francisco was much riskier. I'd pack my clothes and extract out of dad's house the same way, but I had to do it earlier: at 6:00 p.m. Rick -- who truly went above and beyond the call of duty -- would then pick me up a block away for the drive to S.F. Meditation there went from 7:30 p.m. to 8:30 p.m., followed by a light dinner cooked by disciples. We'd begin our drive back home at about 9:00 p.m. I wouldn't sneak back into the house until near 10:30 p.m. -- a full four and a half hours later. I was certain to get caught eventually, but like Quiller, I knew the risks, did the best to minimize them, and then got on with the job. This would be my routine for the next eight months, until I graduated school for good the following June. I never got caught. Thanks to a dad who was working full-time as a cop and then moonlighting just about every night at the local hospital emergency room. Thanks to some good cover work by my younger brother (more about him later). Thanks to Divine intervention. Whatever the reason, I never missed another Center meeting.